Publisher: U.S. Brewers Assoc., 1933. Reprint Edition, BeerBooks.com, 2006. Soft Cover, 260 pages, 6x9. Published in 1933, History of the Brewing Industry and Brewing Science in America is one of the most overlooked resources on American brewing history. The manuscript was researched and written primarily by venerable brewing industry historian John P. Arnold, but completed by Frank Penman after Arnold's death in 1931. Fittingly, the work was published as part of a memorial tribute to America's two leading pioneers in brewing science  Dr. John E. Siebel and Anton Schwarz  and includes detailed biographies of both. To make this rare and valuable brewing text available to beer enthusiasts and historians, BeerBooks.com has reprinted the book directly from a 1933 first edition copy. The authors trace the progress of beermaking in America from the colonial period up through the Civil War, then shift into a detailed discussion of the vast scientific and technological developments made in brewing from the late 1800s up to prohibition. How those advances transformed brewing in America into a great industry is the recurring theme. The authors depart from their main purpose periodically to examine the simultaneous advancement of the "fanatics"  the prohibitionists. That parallel study concludes with a rationale, from the brewers' point of view, of how the prohibitionists succeeded in destroying their industry. The book concludes with an invaluable 40-page "Chronological Calendar of Breweries" from 1630 to 1864, outlining the major breweries to be established during that period. 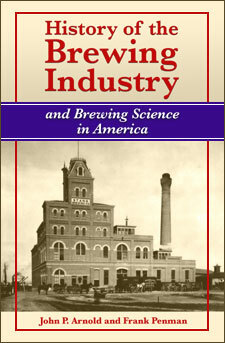 From the book's opening paragraph: "It is doubtful if all history can present another chapter as curious as that of the American brewing industry  how, after going along for centuries in a quiet, unassuming way, largely as a household occupation, it took a spurt and within half a century grew to be one of the biggest industries of the country  how, when at its height, it was suddenly cut off and destroyed by prohibition  how it lay dormant for thirteen years and was a suddenly resurrected by popular demand and hailed with general acclaim and began remounting rapidly towards greatness equal, if not to be superior, to its former stature." Memorial Address by Max Henius, Ph. D.
Before the time of the Civil War the brewing business was not conducted on such a scale or in such a methodical manner as to deserve being called an industry. It was the spurt in industrial development and general prosperity following the War, coupled with the introduction of lager beer, which, about that time, although first introduced about twenty years before, was entering upon its conquest of the popular taste, that raised the business to an industry. In the earlier part of the nineteenth century brewing was practiced in a primitive way, with primitive implements and in primitive buildings. There were open fire kettles, placed in rough sheds over underground cellars. Cellars, when possible, were run into the sides of hills or mountains, brewers often locating their plants some distance out of town where there was a handy hillside. In some instances, marvellous cellars were dug into the solid rock of a mountain. In the cities, the cellars at times extended under the streets, and in later years very substantial vaults were built which carried street traffic for decades. At times, the vaults would be located at some distance from the brewhouse and beer was hauled to them for storage. Occasionally vaults were built in big sand hills. There were cases where the brewing water was carried in pails from a neighboring brook, and malt was ground in a hand mill. Brewhouses were at times set up on virgin land and it would happen that the brewhouse was built from trees felled on the site where the house was erected. In some cases, the pioneer brewers had to take up their guns and fight off the Indians. Natural ice was used wherever obtainable, there being no mechanical refrigeration. It was the climate that largely prevented the early development of brewing in the Southern States. The pioneer breweries were small affairs. Kettles of eight or six barrels were common. There is mention of cases where two barrel kettles were used. The early brewers delivered their own beer, often in wheelbarrows. Quite commonly the customers fetched their beer themselves in pails. Before the middle of the century all beers were top-fermented. Most of it was "common" beer. There was much "small" beer. Ale and porter required better outfits and were not so common although some places, especially the bigger cities, had ale and porter breweries that produced excellent beverages. Philadelphia porter was held equal to the best made in London. In California, even after the introduction of lager beer, "steam" beer continued the popular drink for a long time. It was so called from the "steam" or pressure of 50 to 60 pounds per square inch generated in the shipping kegs which also served in part for storage purposes. The beer took ten to twelve days from mash to glass and it required great skill in drawing from the keg owing to the pressure. Breweries making not more than 150 or even 100 barrels a year were not uncommon. It was quite a sizable business that made 300 or 400 barrels annually. Frequently there were beer gardens in connection with the breweries. It is a far cry from the primitive plants of those times to the magnificent and colossal brewing and bottling palaces of the twentieth century. The change to a real industry began, as has been said, about the time of the Civil War. Many plants were founded before 1864 which continued after that time and frequently became conspicuous in the industry. They had insignificant beginnings, in keeping with the then condition of the business and of the country and its sparse population. Many began as common beer, ale and porter breweries and later took up lager beer brewing. It was not until well into the fifties that breweries were started which brewed lager beer from the first. In the earlier part of this chapter and elsewhere on occasion in the course of this history the development of brewery apparatus has been sketched. It was inevitable that as a result of this line of evolution, which may be called equipment engineering, great progress was also made in what may be called plant engineering and in the architecture of breweries. When the brewery cellars were raised above ground -- although they continued to be called cellars -- when new apparatus were devised, new arrangements made of equipment, everything planned on a bigger and finally even on a grandiose scale, the construction of the buildings must keep pace with this growth, and when wealth came to reward the brewer's labors, there came also a praiseworthy pride of achievement which found expression in grandeur and beauty of outline of the buildings and elegant outfittings within. Heavy machinery, huge vats and tanks holding enormous quantities of liquid, called for sturdy construction, iron and steel took the place of frame. Attention to cleanliness required smooth and solid floors, bringing in cement and tile. Fresh air and light, receiving recognition as requisites, tall windows broke the stately walls. Gravity arrangement taking the place of repeated pumping, the buildings grew in height, and the lofty tower brewhouse loomed high in the air, decorated with turrets and parapets and pointing up towards the flagpole with the stars and stripes flying at the summit, while aspiring arches received the incoming teams and trucks or sent them forth on their errands. The brewery came to be more than a workshop, more than a factory, more than an office -- it became an outstanding ornament to the community, a show-place for the visitor. Serviceable architecture was not entirely unknown in some of the early ale breweries of the East. Some of them built sturdy vaults under ground which were models of durable construction and stood heavy loads of overhead traffic for many decades. Some were so well built that the owners were reluctant to give them up and kept them in use for years after more modern and efficient plans were available. But in the end they had to give room to the new ways. The enormous growth of beer production and consumption in the decade 1880-1890 may be taken as marking the starting point of modern brewery architecture in America. The brewers operating at that time not only accommodated themselves to the rapid increase of business of the day but rightly foresaw a future growth of still greater extent and built for further expansion. Many brewing plants grew up in the next few decades that represent little cities in themselves, with their brewhouse, maltings, bottlery, power house, barns and stables and later on, garages, and palatial offices. Even in the smaller places, the brewery, usually a handsome brick structure with white stone trim, was one of the conspicuous buildings of the city and the brewer himself a respected citizen, proud of his calling, tender of the respect of his fellow-townsmen, and happy in this contribution to the architectural display made by his dwelling place. Greater refinement of efficiency brought constant progress in architecture and plant engineering. The above-ground "cellar" must be insulated to save refrigeration power. Walls were built with insulating spaces, at first air spaces or filled with sawdust, pitch or "mineral wool," later hollow tile and cork or other insulating material. Fireproof construction became general. Wooden tanks even often acquired iron or steel supports and were raised from the ground both to allow better cleaning and to escape the heat of the ground in summer. When mechanical refrigeration first came in, the rooms were cooled by mountains of ice stored in chambers above. Imagine ice chambers twenty feet deep, filled to the top, representing a weight of 1,150 pounds per square foot, let alone the weight of the building. When direct refrigeration without ice became general such massive construction of course vanished. It represents, however, an interesting item in the history of brewery architecture. A short sketch like the present cannot undertake to go into detail to show the construction of a brewery with all its tanks, containers, machines, apparatus, pipes, engines, transmissions, etc., that must be provided for by the architect and plant engineer. Some rearrangement and greater compactness became possible with the introduction of electric power and individual motor drive for the various machines, an essential step in the brewery where there is so much separate operation of different apparatus with occasional peak loads. Since the return of beer, new prospects are opening for further mechanical development, and brewery architecture is assuming new forms. Projects for new brewing plants now being erected or planned show modernistic lines and even extreme tower-like structures. The more modern development of plant arrangement, vat and tank construction and placement, clarifying devices and other apparatus for greater compactness will afford brewery architects many opportunities for further exerting their wits in accommodating the new plants and implements and combining them with modern ideas in building construction. » See more books from our Classic Reprint series.